This unique family home in the Portuguese capital of Lisbon is surely the best of both worlds, most city dwellers have forsaken the experience of a home with a garden and a comfortable indoor living space for a modern townhouse or apartment living space. But this home has taken the best of comfortable modern living and included the essential garden space so necessary in a home, especially as a means to relax and escape the concrete jungle. The expert architecture team at ExtraStudio were however sensitive to the restrictions on building and design elements that have been imposed on the Alto neighbourhood, where this stunning home is located to create a comfortable and pleasant residential atmosphere, maximising the indoor possibilities of the home to make every aspect of living comfortable and achieving the perfect designer home space too. From this angle we can catch a glimpse of the ground floor, a sneak peek at the greenery which is so necessary in modern living spaces and also the upper level which is where the sleeping quarters of this classic and tasteful home is situated. The home has a pleasant and modern appearance both in the exterior and interior aspects, which makes the living space welcoming, inviting and carefully considered in terms of design elements. 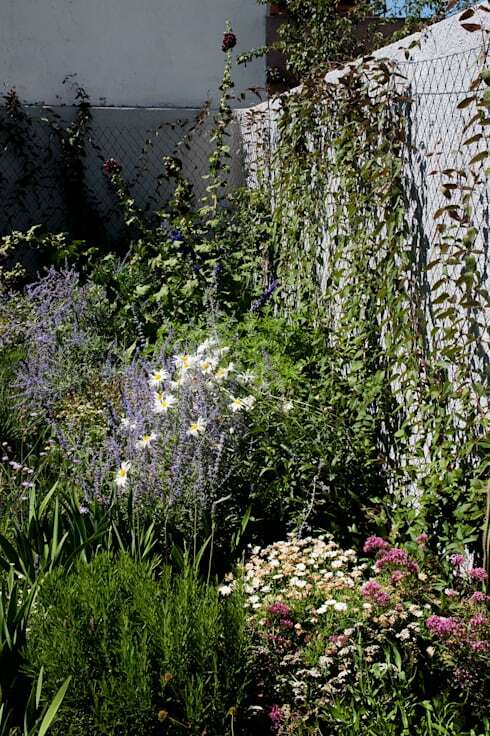 The large garden adds a touch of greenery and that environmentally friendly approach to city living, which has almost been forgotten in current years. While this home holds a secret aspect too… the basement level is almost unassuming and invisible with many people not knowing that it even builds the foundation to this modern city home. While the addition of the tree in the yard area is sure to provide a shady existence as it grows larger! 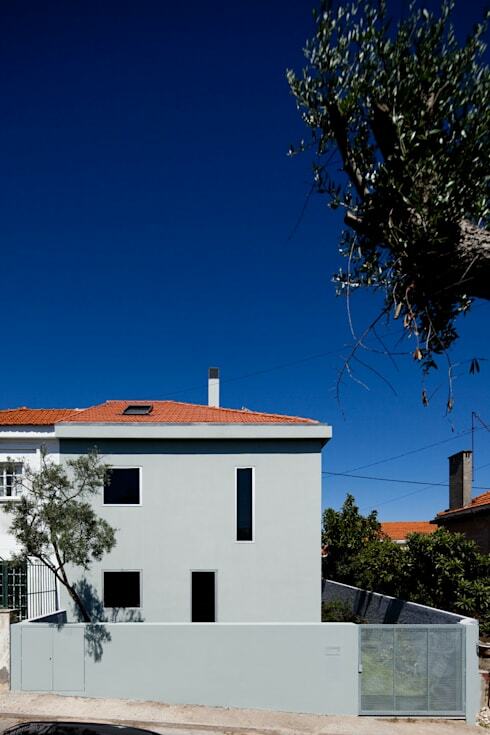 This home in the Alto neighbourhood of Lisbon, Portugal was originally designed in the 1940s and so faced strict restrictions in terms of architectural design and exterior of the home. In order to reconcile these restrictions the older existing house on the property was completely demolished, in order for a newer more modern home to built in its location. The newer home obviously took into consideration the aspects of maximising the use of floor space to build and even larger home but on the same property! This home has completely taken advantage of creating a larger living space by adding in a basement level for extra room, a first floor filled with open plan living ideas and socialising spaces including a fun garden, and the upper floor of the home which is the private area where three bedrooms and two bathrooms ensure enough space for the whole family! This functional vertical stairway ensures that easy access is provided and maintained to go from the simple open plan living ground floor to the first floor where the sleeping quarters of this home is situated, ensuring that privacy of this home is a focal factor and separating the bedrooms from the socialising floor of the home, which is never a bad idea! The open plan living area of the home is where the kitchen, dining and living room areas are housed as well as the garden and an extra guest bathroom, ensuring that the upper floor of this modern home remains undisturbed and private especially when there is an event in the making at home. The hidden underground level of this home is where a studio apartment is housed, allowing the homeowner to make the room whatever they prefer it to be. The possibilities are really endless, from extra bathroom to media room or games room! This exterior view of the modern home provides a bright perspective of the floors above ground, showing off the abundance of windows that have been perfectly situated in different shapes and sizes throughout the home. This allows for the maximisation of natural sunlight being a part of this exterior facade of the home. 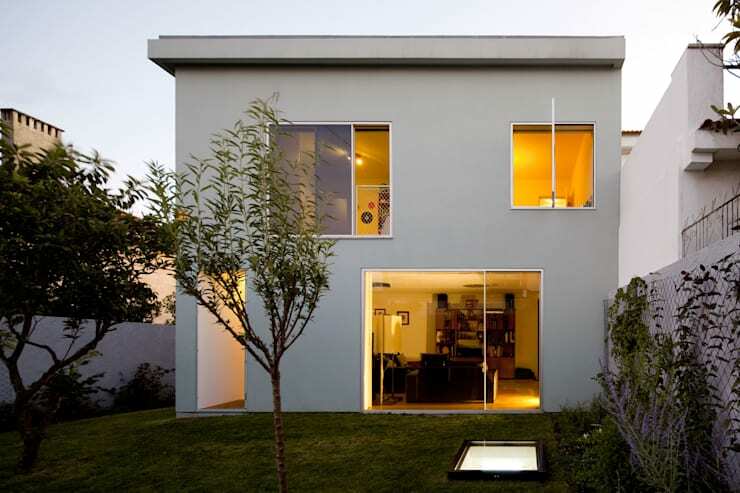 The underground floor of this home has a secret hydraulic window too! 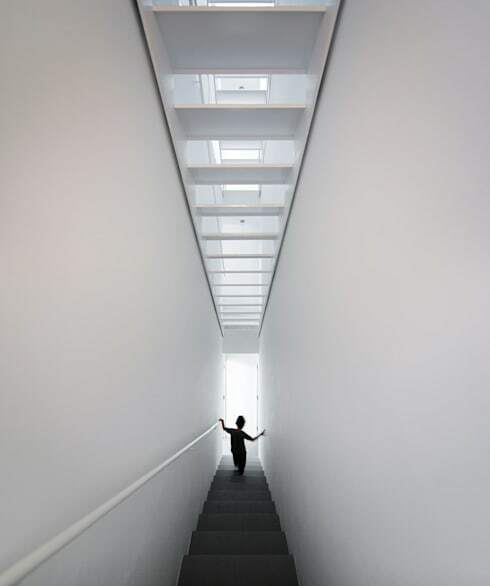 Allowing for natural sunlight to enter into the studio area, almost like a skylight, while at the same time providing some ventilation for the living space. A necessity in any room that is actually below ground and therefore might be more stuffy and claustrophobic. This home blends in well with the rest of the homes situated in this up and coming district, making an attractive and complementary addition to any area through its classical style, design and decor. 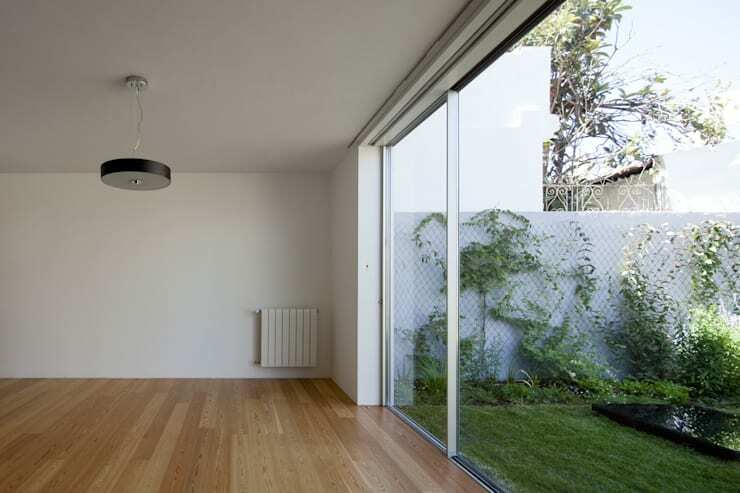 An interior living space such as this allows for a glimpse into the greenery of the home garden, providing an almost dual view of the interior and exterior spaces. The all-walls create a modern and simple addition to the home, making it pleasant, welcoming and inviting to all. The addition of the low hanging light, creates a cosy home interior while at the same time providing an elegant atmosphere and ambience. While the hardwood floors further accentuate the interior, making the living space comfortable and easy on the eye. The glimpse of greenery visible in this living space makes the room that much more tranquil and relaxing. almost serene. Creating an environmentally friendly home is therefore perfect to create a living space that is rejuvenating and stylish. A garden in a home adds an extra example of life, making a residence a bit more special by allowing the outdoor space to be creative and designer too. It's a functional and fascinating place that provides a colourful addition of the outdoor living space too. A garden has the potential to be that relaxing and tranquil area added to a home, making it beautiful and elegant both inside and outside. Having a home with a garden provides a perfectly chosen green element, the types of greenery, bushes, flowers and stunning buds are available in a variety of types, shapes, sizes and mutations, the choices are endless and can definitely create a complementary impact on the architecture and environment of the home space. A visit to this vibrant garden filled with enchantment and magic in the natural tones and hues of the floral arrangement is the perfect way to end off our tour of this stunning Portuguese city home! For more garden inspiration, you might like to check out: Great Tips To Make Your Garden More Fun. 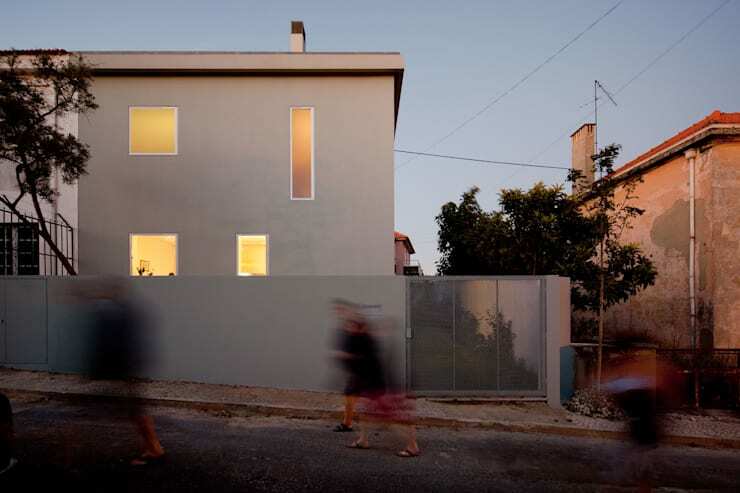 What did you think about this home in Lisbon? Let us know in the comments!